Ok, not the greatest or most grown up of titles but never mind. The is the second big game at home this week which is absolutely fantastic but I couldn't cope with two every week; maybe every other week! The Crown forces did really have an outpost in the Southern theatre of war called 'Ninety Six' which received much attention from the rebellious colonists, so it wasn't much effort to er...., amend its name for this game, featuring an attempt by said Crown forces to lift the siege and relieve their isolated outpost. John the Red was free so we arranged a game. I'd not had my AWI figures out for maybe 2 years so this week seemed as good a time as any to give them an airing as well as glue bits back that seem to have jumped off some of the figures in the confines of their display cabinet. The scenario was simple. Outpost, besieged and close to surrender. Important that it didn't fall. 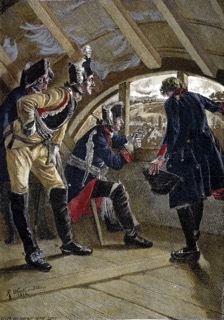 More important that the garrison were saved from captivity. Small but experienced relief column which had to batter their way through superior numbers but inferior quality (mostly) of rebels. Anyway, the game was played down the length of my 10' x 6' table, with the fort (on the table for the first time rather than under it) at the far end, beyond an impassable river crossed by a single bridge. The woods were passable at half speed to infantry and quarter speed to mounted troops. Fences and cultivated areas e/affected line of sight but didn't count as cover, the former slowing troops crossing them slightly. The forces were as follows, based on the many units I have available but with no real need or desire to do anything resembling any actual orders of battle, especially as I wanted to get my lovely and venerable Hinchliffe Hessians out! We used Black Powder of course, with appropriate troop characteristics added as required which is what I like most about the rules as well as the ability to twiddle and fiddle with stuff as long as you don't go too far and loose the whole point behind the set and the games they produce. Cavalry: 1 squadron each of 17th Light Dragoons and Queens Rangers Hussars (1st time out for the latter). (Above, all the Crown forces have to do is get through that lot. Below, the Hessian brigade move forward). 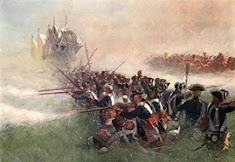 (Above, the Hessians near the Rebels lining the fences while below "The Guards will advance! "; the British left-hand brigade advances). (Above, Rebel riflemen enfilade the flank of the lead Guards battalion while in the distance the Queens Rangers Hussars make short work of an isolated rebel gun. Below, Webb's Continental regiment leads the Continental reinforcements forward over the river). (Above, the British reserve brigade has finally advanced and crests the hill overlooking the rebel second line, A fine site! 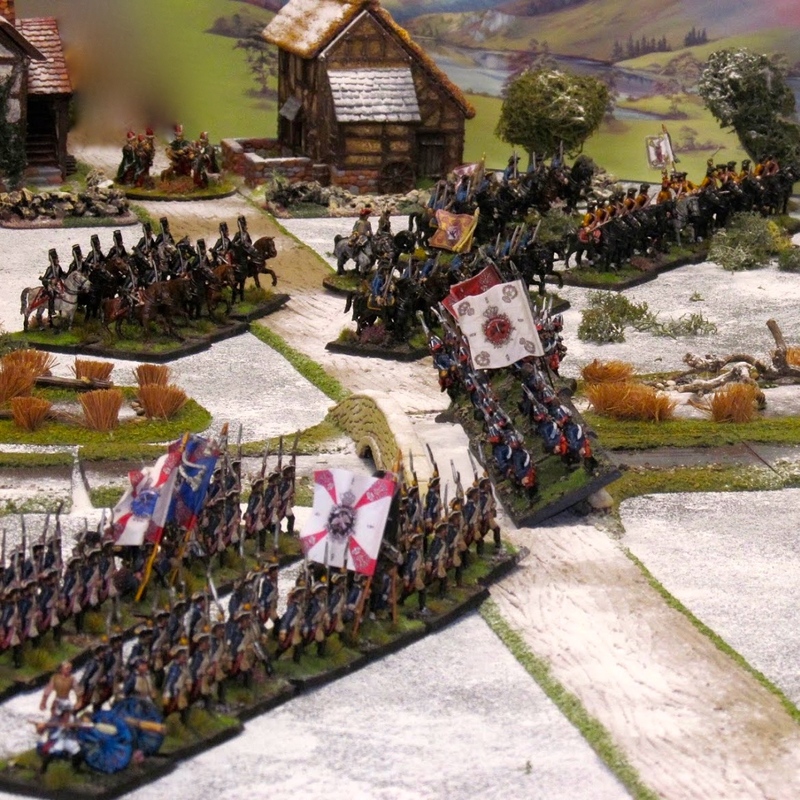 Below, the 17th Light Dragoons are charged and pushed back by the 3rd Continental Dragoons). (Above, Armand's Legion cavalry forced the Hessian Jager to retire but when they crested the hill found a surprise waiting for them! Ooops! Below, the Queens Rangers Hussars). (Above, the Grenadiers and HM 71st Foot. Below, the Volunteers or Ireland seen from behind the breach of the rebel siege gun). (Above, behind the rebel line. Below, the Guards about to make their last assault). Hopefully the photos give a good indication of the progress of the battle. The Guards and Hessians were held up at the first fence line for longer than John might have wished and it would have helped greatly if the reserve brigade had managed to pass its command rolls several moves earlier! Making the first line of militia wavering and levy did help but while they were in a position to shoot they were very effective; indeed the Guards light companies were shaken then broken early on in the combat and the lead Hessian battalions were both shaken (but they recovered) at one point. to move from the right to left flank but the 3rd Continentals turned about and made an heroic charge towards the 17th Light Dragoons and threw them back shaken. In the follow through move they hit the Queens Rangers Hussars and achieved the same result, but not without becoming shaken themselves and having to withdraw. On the other flank, and as pictured above, the cavalry of Armand's legion came to an enthusiastic but sticky end after a point blank volley from Hessian musketry. Back at the fort we both remembered that we had troops available, John moved his cannon and started taking pot shots at the Continentals moving across the bridge in support of their militia comrades, and my riflemen covering the fort blundered when trying to get into better firing positions and ended up retiring out of harm's way. The siege gun was singularly ineffective and probably didn't even manage to hit the fort, let alone anyone in it! So, at the end of the game, the British attack was about to push back the rebel second line and three rebel brigades had been broken. As a reminder, once over half of your units in a brigade are broken or shaken the brigade is classed as spent or broken, and once half of your army's brigades are broken "for you the war is over" and the battle is over, unless we've agreed anything different. A very tough game for the British but once they got started and got their reserve brigade engaged it was only a matter of time. The rebels nearly pulled it off as the British were also close to having the Hessian and Guards brigades out of the game; one more unit shaken from each and the british would have been forced to pull back. As I write this the long-awaited Black Powder supplement for the American Revolution has become available for pre-order. I can't wait to see it. Fantastic display! Really impressed with your fort and stockades. Is this a custom built item? Please tell me more about this piece as I could use one of those. Thanks Jonathan. I picked the fort up off eBay last summer. It is scratch built. Nice battle report, great photos! Nice pictures and a fun looking game thumbs up! Nice looking game, great pics! Beautiful photos and beautiful story of the battle, congratulations. 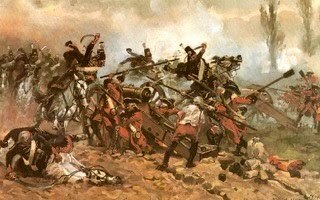 The AWI is one of my favorite periods in history, I love the redcoats and rebels! Excellent looking game and grand AAR! Well hosted and challenging game, as ever. As the commander of HM loyal forces in the colonies, i did find the task a little daunting, seeing row upon row of rebels disappearing into the woods ahead. The plan i settled on was a pinning attack by the Hessians, a left hook by my reserve British brigade, followed by a charge up the centre by the Guards. However, my left hook consistently refused to join in, or indeed move at all once on the field of battle. (a constant and depressing run of 9s and above on the command role). 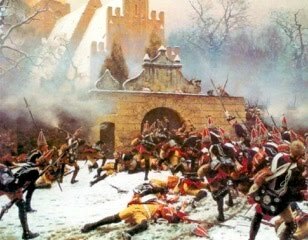 To avoid seeing the Hessians unsupported, i sent in the Guards who lived up to the elite status and calming dispatched various rebel skirmishers and militia as they slowly worked thier way through the woods. I felt the gentle hill on the left was the key to American line. The failure of the reserve brigade to advance lead to me sending in detachments of horse and the combined light companies. The former swept the hill clear, the latter were defeated and forced from the field (beated by rebel riflemen, after two rounds of fighting and rolled 4 in shaken test!). Finally my reserve brigade advanced onto the hill and then swept down in the final move, to catch one unit of Continentials trying to deploy from column and militia lining the fence at the edge of the woods. 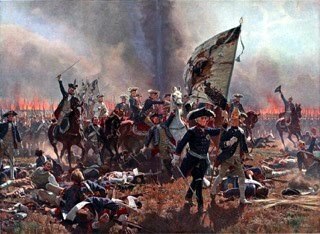 This combined with the defeat of the American horse who had bravely / rashly charged the Hessians broke the overall spirit of the rebels who would have had a fairly challenging time extracting themselves post battle. Thanks John. Maybe next time we can change sides and do something less complicated. Be good idea to try out the new BP AWI supplement which is out early next month.